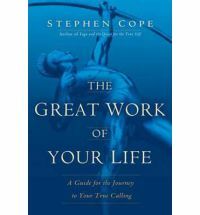 I’m reading Stephen Cope’s The Great Work of Your Life: A Guide for the Journey to Your True Calling. Long story short, it’s about finding one’s dharma. If the word ‘dharma’ is too eastern mystic woo-woo for you, try the word ‘passion’ or ‘calling.’ Whatever you call it, it’s the thing that causes you to jump out of bed—or at least crawl out with some level of energy—in the morning. Like so many others, Cope says that your passion doesn’t have to be your work—lovely if it is since in our culture we spend so much time at our job—but it is something that you are meant to do. That may sound a little too pre-determined, but the thing about your passion is that it takes the forms that you provide for it. If you listen to your small still voice, it may lead you down those roads less traveled, but even if you can’t hear the voice above the din or if you ignore its urging, you may find yourself bringing your passion to work and the situations in which you find yourself. Like a cook that adds a signature spice to almost every dish, you bring what you care most deeply about to your everyday life. The challenge for all of us is to find that thread and follow it and, at the same time, to make it all work from a practical standpoint—so somehow, we have passion in our lives as well as a roof over our heads and food on the table. How we put that together is different for each one of us—but it’s an equation worth discovering. Happy accident! Glad you found it.